In Chinese tradition, parents would celebrate baby birthday after one-month-old or 100-day-old. Design with Chinese style motif and an “It’s a GIRL” slogan, this invitation creates a modern but with Chinese cultural sense. Of course, you will need an excellent invitation for this important event. It is the one-month-old birthday of your baby. This is a very simple yet elegant design. 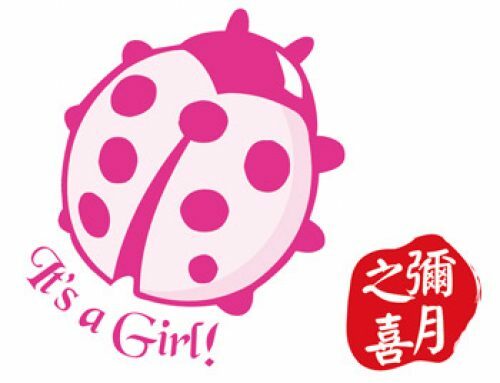 The focus of the design is, of course, the main slogan “It’s a GIRL”. This is something self-explained. A newborn baby girl has come. To celebrate the arrival of the new life, this design is very colorful. The colorful bending strip looks like a necklace. It is, in fact, a gift giving to the newborn baby. The colors of this strip are mainly red and green. They are colors of celebration. The pattern design for this “necklace” is also very special. We attempt to include elements of Chinese culture in this design. People can somehow tell it is something Chinese when they see this pattern. 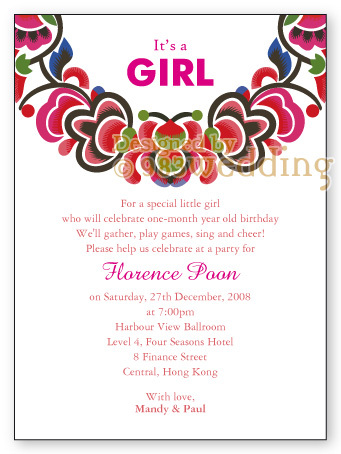 Though it is very colorful, the design of this baby birthday invitation is not something very busy or clumsy. In fact, the slogan and the strips are the only prominent graphic elements you can see in the design. The first thing you can see from this design is certainly these two graphic elements. It is a design which is considered quite clean and simple. It will never be something busy. We even do not choose some fancy fonts in this design. As you can see, the phrase “It’s a GIRL” is printed with a very simple font. The color of the wording blends with the strip. As a result, a cherry blossom color is chosen. As usual, the color used to print the name and the main phrase will be a bit more prominent. This design will be printed on an off-white piece of pearlized paper. Other kinds of paper stocks can also be used when needed. This design is not only for a newborn baby girl. It is also possible to use it for a boy. We can change the word “GIRL” to “BOY” so that the phrase will become “It’s a BOY”. This will suit the birthday party of a baby boy. Card with full color printing on ONE inside. 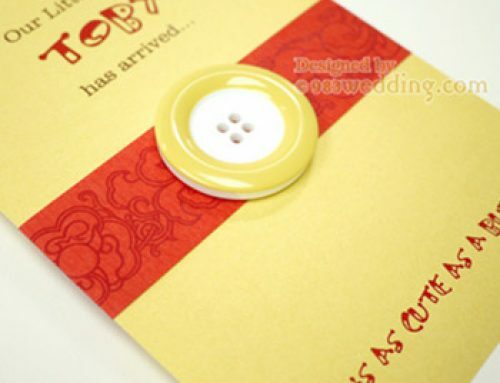 Addresses of the guests would be printed on invitation envelope on request. “It’s a GIRL” would be changed to “It’s a BOY” on request.